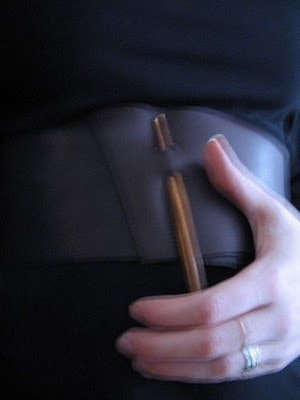 this one comes from hende of re-purposed leather and a wooden pin to close your corset. and by the way, oh my gosh, i am totally enamored with this shopkeeper's profile on etsy! her balance of life seems very serene and inviting to me right now... go take a look too! not only using sustainable materials, but keeping her whole eco-footprint as small as can be by keeping errands to fewer days. i did! i did go! wow! what a blessing to be able to follow up on a goal! back in october i had stumbled upon hospitality house's community art studio during an open studios walk. i found a wonderful welcome and the offer to come back and paint, work with clay, make an artistic kite, paper machie... so many creative options! i was like, "ok! 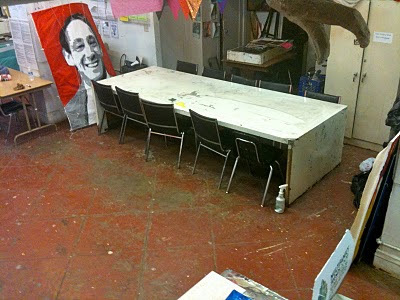 i'll be back within a week to have an artistic day". cuz i knew if i didn't do it soon, i may never get back. jump right in! however, i did not go back in a week. instead it's taken me 7 months to get my creative little hands back to that site. but i made it! and it was a wonderful experience. not only did i get a personal lesson on how to throw clay on a wheel, i met some other inspiring artists who make time for their creativity, got shown the screen printing set up, and found a wonderful new community. 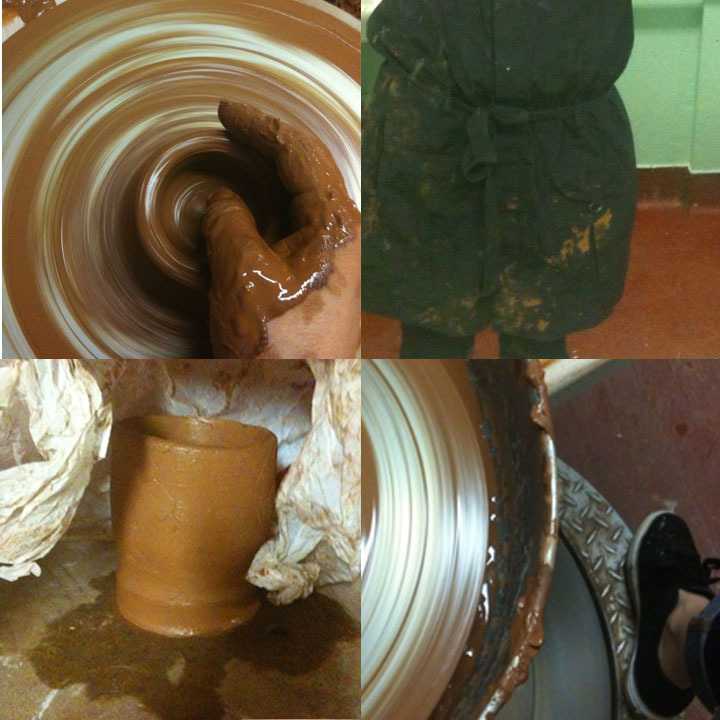 i really sunk myself into the moment as i was working with the clay on the wheel. to cone it up and cone it down, feeling the cool clay work against my hands as the wheel forces it around and around... it was just as i had imagined way back (at least) since 2004! that's when i ran a girl scout camp with two potters wheels. i thought i'd have the whole summer to make lots and lots of pottery. yet, i made only one item, hand pieced and had to reboot the kiln after the art teacher had shut everything down for the season! so there's a glimpse at how i use to dis my inner-artist. that's why it's so important to me today to listen to that creative voice and take action to explore my talents! and to practice at messing up and improving my technique! i give thanks to the artist's way book group i'm involved with this year and for it just being time for me to hear this message from the universe. creativity is vital, it's a gift, and it's an obligation! oh, and p.s. the clay was recycled! bonus! it's a new year for me! hi all, yesterday was ma burfday! it was a fun time. lots of love! i'm now 37 years old. whhheee!!! i've been inspired by folks who do those birthday lists and i've been drafting mine for the last couple of months. well, the day is here now! below is my final [?] list of stuff imma do for me for the year. my adventures. there's some fun stuff in there and some challenging items as well. some things i've already begun doing and feel they are important enough to mention and keep up for my 37th year. side note: may examples of other peoples lists are from 20-somethings... is this fair? i'll just have to keep focused to get my longer list accomplished! 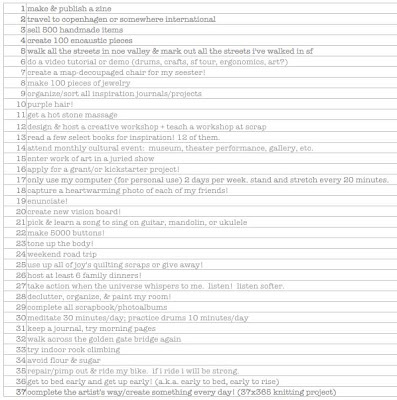 i did come across one woman's blog who had a 50@50 list, but it looks like she's taking longer than a year to complete. cuz that's almost be a thing a week! coincidentally, her blog is called 37days and each morning she asks herself, "what would i be doing today if i only had 37 days to live?" i plan on using that guide as well to accomplish my year's vision. 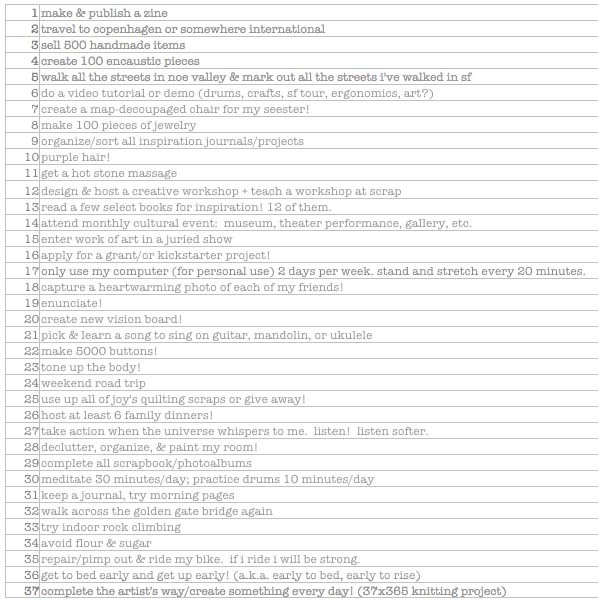 a caveat - i will complete these 37 listed items by the time i turn 38. i will periodically update my list to show my progress, i'd love your support! i reserve the right to swap out a listed item for something more relevant or of equal challenge. cuz i can't predict the future. mpdl. have you worked on a set of goals for your birthday year? how are those 2010 goals going? let's all jump in where we are and bathe in the abundant awesomeness waiting for us to make a splash!